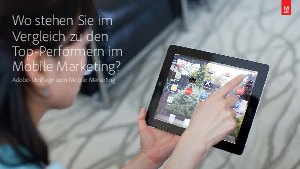 > Adobe > Wo stehen Sie im Vergleich zu den Top-Performern im Mobile Marketing? This research analyses the best practices among mobile marketers, from “experts” in the field to more recent arrivals. These professionals work in a variety of industries—media and entertainment, retail and commerce, financial services and B2B high -tech—and perform mobile marketing activities on a regular basis.